Just a hoax. A fear-mongering hoax. A so-called Facebook "public service announcement" on Aug. 21 that warned of a “new deadly spider species” spreading across the United States went viral, but it was all fake news. The images that the South Carolina man posted are of a woodlouse spider, Dysderca crocata, and it's neither new nor deadly to humans. Unfortunately, many gullible people--probably many who cringe at the very sight of a spider!--believed the hoax. And even more unfortunately, the post went viral. “This beast, Dysderca crocata, has been in most of North America for decades,” Art Shapiro, distinguished professor of evolution and ecology at the University of California, Davis, told us. “That includes California. It occurs mostly around buildings, especially if there is a mulched garden where its primary prey, isopods (rolypolies, pillbugs), live. I've had it at my place for years, but the number of pillbugs went way down during the drought and I haven't seen the spider lately." Wikipedia informs us that "The woodlouse spider, Dysdera crocata, is a species of spider that preys primarily upon woodlice. Other common names refer to variations on the common name of its prey, including woodlouse hunter, sowbug hunter, sowbug killer, pillbug hunter and slater spider." 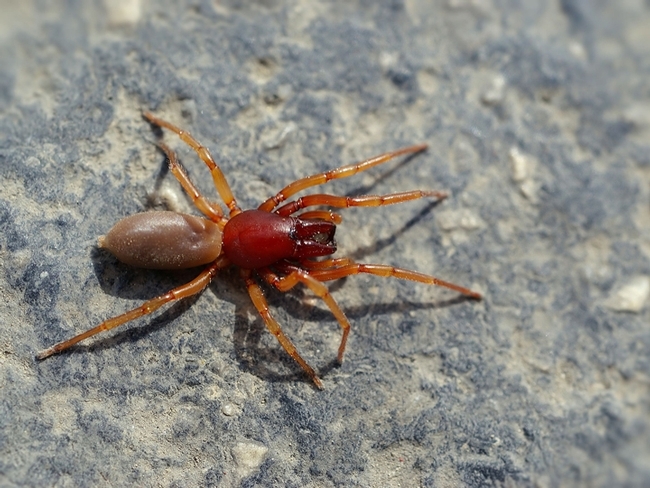 "Female specimens are 11–15 mm (0.43–0.59 in) long, while males are 9–10 mm (0.35–0.39 in).They have six eyes, a dark-red cephalothorax and legs, and a shiny (sometimes very shiny) yellow-brown abdomen. Notably, they have disproportionately large chelicerae for a spider of this size." 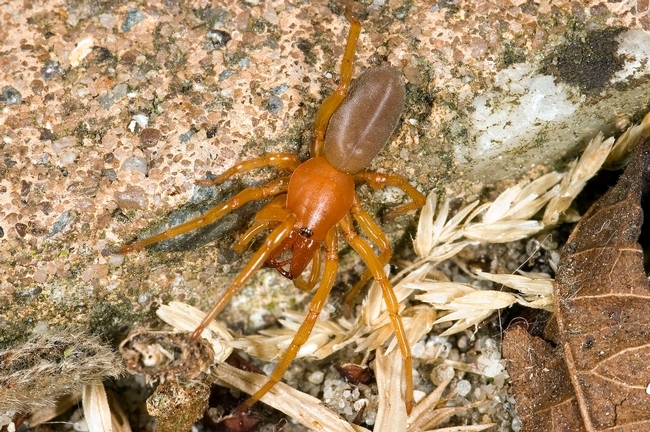 Native to the Mediterranean area, the woodlouse spider is found throughout much of the world, including North and South America, South Africa, Australia and New Zealand. It's found "under logs, rocks, bricks, and in leaf litter in warm places, often close to woodlice," Wikipedia relates. "They have also been found in houses. They spend the day in a silken retreat made to enclose crevices in, generally, partially decayed wood, but sometimes construct tent-like structures in indents of various large rocks. Woodlouse spiders hunt at night and do not spin webs." "Too weird," commented Lynn Kimsey, director of the Bohart Museum of Entomology and professor of entomology at UC Davis, who fields lots of questions about insects and arachnids. "Funny that they picked this spider. Its ferocious looking but tiny and probably couldn't bite you even if it wanted to." Sadly, Arachnophobia, or the extreme or rational fear of spiders, is very real--unlike the disturbing hoaxes that keep popping up on the Internet.